Looking for high-quality financial and tax advice and complete accounting services at a reasonable price? Welcome to our firm. 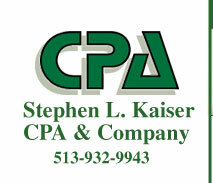 We offer accounting, taxation, and small business consulting services with the personal touch. Our website details a full range of services, contact information, and a company profile, so click around and stay for a while! But don't hesitate to call us; your initial one-hour consultation is free. Call 513 932-9943 for information on available services. If not in the calling area... call toll free at 877 932-9943. My office is located in Beautiful downtown Lebanon, Ohio, at the corner of Mulberry and Sycamore Streets. 1 1/2 Blocks from the Historic Golden Lamb Inn. Office hours are by appointment, with evening and weekend appointments available. Refund anticipation loans are available for returns prepared in my office. Receive a check in 12-36 hours.